Product prices and availability are accurate as of 2019-04-18 21:36:31 UTC and are subject to change. Any price and availability information displayed on http://www.amazon.com/ at the time of purchase will apply to the purchase of this product. This item by "We Sell Mats" is designed by our product engineers with quality, durability and value in mind. Because all "We Sell Mats" branded items are sold specifically be "We Sell Mats", you can always be confident that you will receive a quality product at a great price. Comes with orange interlocking anti fatigue tiles. Each measuring 2' x 2'. Each tile measures 3/8" thick. Borders are included. Perfect for ages 3+. Provides a cushion to hard floor surfaces in gyms, exercise rooms, trade shows, playrooms, etc. Does not work well on carpets. 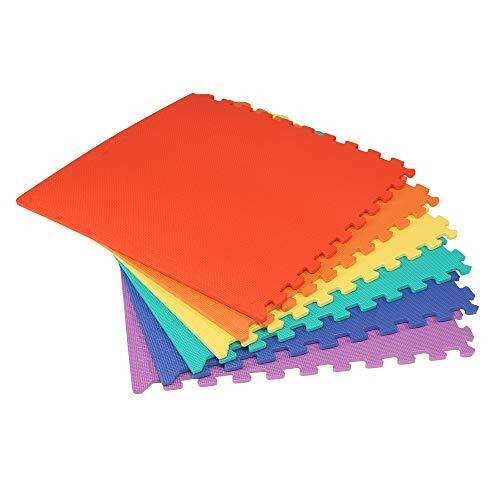 NEED A DIFFERENT COLOR OR SIZE MAT? Check our Amazon store for more options. Comes with orange interlocking anti fatigue tiles. Each measuring 2' x 2'. Also available in checkerboard. Each tile measures 3/8" thick. Borders are included. Provides a cushion to hard floor surfaces in gyms, exercise rooms, trade shows, playrooms, etc. This item will interlock with all 24"x24"x3/8" EVA foam "We Sell Mats" tiles.